The Darkness are getting back together to play the Download Festival five years after splitting up. The rockers, who had five top 10 hits including I Believe In A Thing Called Love, are appearing as special guests of headliners Def Leppard on Friday June 10. 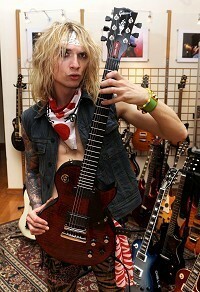 Frontman Justin Hawkins said: "The idea of playing Download terrifies us. We played in an early slot on the main stage in 2003 and we were frightened then. "It's reassuring to know that nothing has changed. "On a serious note, it's the most rockest of festivals and the perfect place for us to begin the next phase of our journey." The band, from Lowestoft in Suffolk, had a number one with their first album, Permission To Land, which won the Best British Album award at the Brits in 2004. The line-up for the festival at Donington Park also includes Funeral For A Friend and Skunk Anansie.